One of the most often visited areas in northern California is the Napa Valley. Hot air ballooning is one of Napa Valley’s most unique activities for you and your family to enjoy while visiting. It is definitely one of the top Napa Valley tourist attractions. It is a great way to see the Valley, it can be an exciting mode of transportation, and it is always an experience you will be glad you didn’t miss. Hot air balloons have been around since the 1700s. They were first invented in France. Since then, hot air ballooning has become a hobby as well as an attraction for both its participants and spectators. People love seeing hot air balloons floating above their heads, and passengers enjoy looking down from above at the people who look so tiny down below. If you are ready to experience hot air ballooning for yourself, contact Balloons Above the Valley at 800-464-6824 to schedule your adventure! When you plan your flight, one thing to remember is that you will need to be there early. Because weather can affect ballooning, most hot air balloon rides are limited to early morning hours. At this time the air is more stable and the takeoff and landing are easier to maneuver. If it is a windy day, the balloons will not take flight, for the safety of all involved. 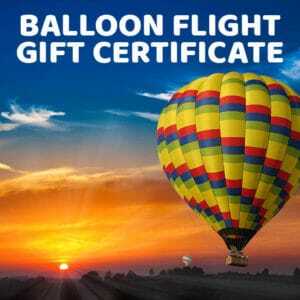 Usually hot air balloon rides will last about an hour and will soar to 1,000 to 3,000 feet in the air. This is high enough to see the countryside, but low enough to see the vineyards below. When planning your adventure, be sure to check the meeting time during the time of year you would like to book your reservation, as the meeting time changes throughout the year. We recommend allowing at least 4 hours for your adventure, this will include transportation time as well as time for your champagne brunch that follows your flight. One of the most-often asked questions about hot air ballooning is how does the pilot steer? There is no steering mechanism on a hot air balloon. There are usually ‘layers’ of air movement, and these layers move in different directions, and at different speeds. The pilot will use altitude to change the direction of the balloon’s flight. Altitude is adjusted by adding or removing the hot air in the balloon. The temperature of the air will somewhat affect the balloon’s flight, which may result in fewer passengers being able to enjoy the ride if the outside temperature is already very high. Balloons prefer cooler temperatures, so the balloon company will keep a close eye on the weather and schedule passengers based on what the weather will allow. Companies have different policies about their flights in higher or lower than average temperatures. Be sure you speak with Balloons Above the Valley staff to learn their policies about scheduling in different climates. Hot air ballooning is a great way to spend time relaxing and enjoying a unique view of the Napa Valley.